This newly renovated ocean-front condominium complex is under new management and is located on the quiet south portion of New Smyrna Beach. The south portion of the beach has no car access. This ground-floor unit views the beach, the pool and a grassy area. The living room has two leather sofas (one is a sleeper sofa), love seat, flat screen TV and recliner. 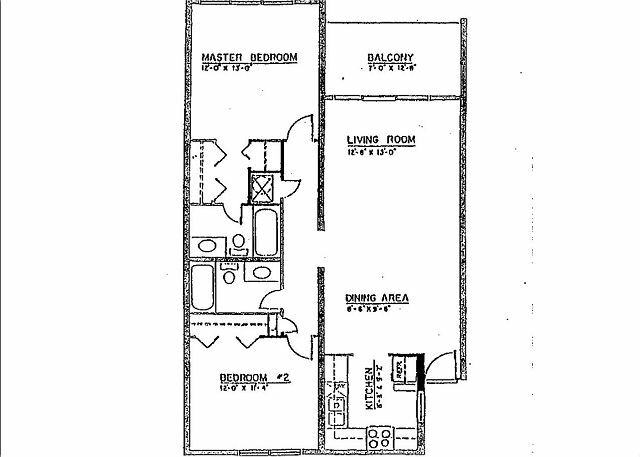 The master bedroom has a king size bed, TV and private bath with a safety grab bar. The second bedroom has twin beds, TV and a hallway bath with a shower and a grab bar. The kitchen is equipped with modern appliances. This 1,000 sq. ft. unit is fully furnished and equipped with central air/heat, three ceiling fans, color TVs, refrigerator w/ice maker, self-cleaning oven, dishwasher, disposal, cooking utensils, small appliances, dishes and linens. This unit accommodates six individuals but no pets. Castle Reef is a family-friendly complex. It has a large oceanfront pool (heated in winter) with lounge chairs and tables, a kiddie pool, a poolside gazebo, shuffleboard courts, tennis courts. BBQ grille, clubhouse w/kitchen area, laundry rooms, tropical landscaping, beach w/lifeguard tower and Wireless Internet. Ideal for nonsmokers. Our stay at the condo was enjoyable. I especially enjoyed walking and biking on the beach and surrounding area. The landscaping is well taken care of and beautiful. The location is convenient yet off the high traffic areas. The room was clean and we love the area. Makes for an enjoyable stay. We have stayed at Castle Reef for 6 years now and really love the location and amenities. The condo was great - the only thing was that the laundry was left in a bag for us to put sheets on the beds. Other than that we would stay there again. Our relatives were pleased with the condo too. I can not say enough about our stay at castle reef condominiums. The grounds and staff were wonderful. Everything was clean and well maintained. The check in and out process was convenient and so easy. We were even able to check in early. The condo itself was a little outdated but it had everything we needed and was very comfortable for two adults and a young child. I would/will be looking to rent this condo again in the future. Thank you for such a wonderful stay. It made vacation that much more relaxing. David the manager and Cindy are very nice people.Great vacations !!! Fun times at the beach with family and friends! Awesome place to take your family! We have made friends that return each year and we always look forward to sharing time with them. We feel very safe on the property and allow our children to roam freely. The area is very convenient with shops and dining within minutes. We will retun and my children cannot wait ! clean, secure, on the beach!!! This was our second time in this unit. Our young family loves the pool area, shuffle board and beach front. We always choose a first floor apartment for easy access to the pool. I would recommend 107. It is nicely decorated and fully tiled, which is great for sandy feet. Master bath is getting old though. This was our 14th year at Castle Reef, so it is obvious that we love it here. It is more about the friends we have made here and the location. This is our second stay in this condo. We went back b/c our first stay was just incredible. There walkout to the pool and beach is so pretty and a very short walk. You can hear the waves at night while you are in bed. Just a nice, relaxing place to stay. we love staying on the ground floor. such easy access to the beach and pool and parking lot. convenient location, tile throughout, leather furniture. Overall we had a good week! Unit is in a great location with easy access to the pool, beach and parking. Cleaning could be more thorough. Bring your own beach towels and chairs. We return to Castle Reef every year. I grew up vacationing here and now I bring my kids each winter. The condo has a great layout, we love the pool area and the beach is beautiful. It is a great family destination. Stayed right on the beach. You can sit by the pool and look out over the ocean. It's fantastic.